A MUST DO ACTIVITY ! AND THE BEST BALLOON COMPANY TO DO IT WITH . YOU ARE IN GOOD HANDS WITH ASSIANA ! READY TO FLY WITH ASSIANA ? Coffee and Cake before flight. Coffee and Cake before flight.. Chose the Standard flight if you are an early bird. Chose the Comfort flight for a later take off time. Chose the Private flight if you prefer our exclusive service. Our passengers are picked up from their hotels and brought to the Take Off area about one hour before the flight. 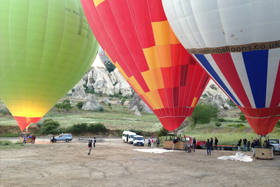 Passengers can enjoy their coffee and cakes while observing the flight preperations and inflating of the balloons. 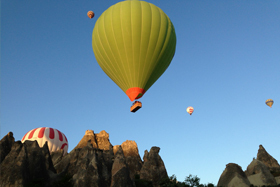 Since our balloons take off from within the valleys where all the action is, Our Passengers get to experience the wonders of Cappadocia right from the begining, following a slow ascend. Get your cameras ready for incredible photos. start the descend towards a suitable landing area. 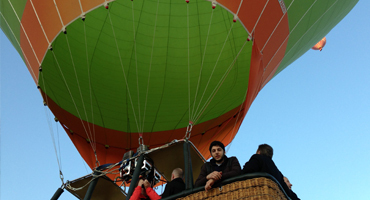 The balloon is received by our experienced ground crew. 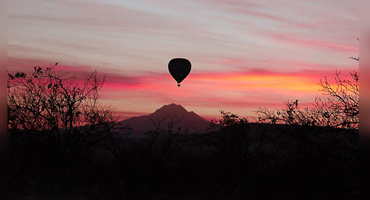 "Assiana Balloons" is the queen of hot air Ballooning.. Copyright © 2013. Assiana is an NT Group company.